2-in-1 Design: High-precision Fine Point&Sensitive Mesh Tip;The active pen has a 1.6 mm fine copper tip,giving you a realistic feeling for creation, making it the perfect tool for drawing and painting on your device's screen,and Internal elastic design buffers the strength of clicking.The conductive fiber tip cap is also workable even the pen is power off. Wide Compatibility:Stand-alone active stylus design. NO Bluetooth or app required. Perfectly compatible with most touch screen devices, including iPad Pro/ Mini/ Air, iPhone X/ 8/ 8 plus/ 7/ 7+/ 6S/ 6 plus, Samsung and other Android Tablets, etc. *Note: Not suitable for Windows System. Rechargeable & Power-saving:With the built-in battery, it is able to work continuously20 hours. It recharges by Micro USB cable (included), and will turn off automatically after 5 minutes of inactivity. Compatibility: iPad tablet series, Samsung tablet series, iPhone series, Android phone etc. Note:Not match to Windows system and ipad Air 2. 1.Please do not use while charging. 2.To avoid delay of response, please close idle Apps as much as possible. 3.We suggest use screen protector to prevent the screen from scratch by dust particles when use. 【2-in 1 Design】The stylus is made of high-quality metal.The 1.6mm elastic copper tip and rubber cover make a feel of real pen.The fabric tip can be used without electricity.Perfect for note taking and sketching apps. 【Sensitive & Smooth】The stylus has a 1.6mm elastic copper tip gives you the accuracy you need and provides superior control and traction against tablet screens. In addition, the anti-fouling glove reduces the friction between your hand and the tablet surface, as well as making drawing more comfortable. 【Wide Compatibility】The pen matches to most touch screen devices such as iPhone, iPad, Samsung and others. It works directly without set up, no Bluetooth or app required. ★Note: Windows system is not matched. 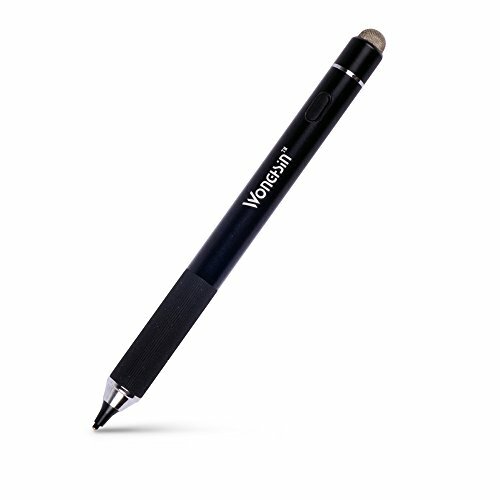 【Rechargeable & Power-saving】With the built-in battery, the pen is able to work continuously for 20 hours after charging 1~2 hour. The pen will be power cut automatically without any operation for 5 minutes. 【100% Customer Satisfaction】We promise 30 days money-back and 12-months guaranty.If you are not satisfied with our stylus or you have any question, please contact with us to get a after-sale service, we will give you a satisfied response within 12 hours. If you have any questions about this product by wonghsin, contact us by completing and submitting the form below. If you are looking for a specif part number, please include it with your message.